I like it as is. Size at 38/39 is fine; much bigger, would be too large for my tastes. The hands imho are perfect-in keeping with the classics of it etc.. It looks to be an excellent addition to the stable, overall. Looking forward to seeing it come to life, (hopefully). Agreed. Do I need to reserve a number now? Please do not change the hands. As the watch is 'all-dial' anyway, anything bigger than 38mm will look silly. At this stage, it does not appear to be LE, nor an LE list in the offing. I didn't propose making it a limited edition Brian, it's another one I would like to keep in the range. (I'm not esp. concerned either way, tho would purchase one for th great design, quality and overall excellent attributes). The Orfina Mark II has a magnetic protection of 100000 A/M. I bought one for this reason solely. I think as a tec. feature it is awesome, as is the secured crystal of Sinn and Damasko. I think fixed bars are very cool, but I'd prefer drilled lugs. Sounds like a great project Eddie. I was proposing the same finish as the sides of the PRS-14. For those who have one, they know it's better than brushed. That is indeed a very nice finish! Please don't go with fixed bars, they limit the strap choices too much! It's almost perfect and i'd be very interested in taking 3 of them. The one request I would make is to concentrate hard on getting the hands perfect. I let my Speedbird 2 go because the hands just weren't up to the rest of the watch. In my view this MK XIhas the hand treament that works best in this style. Getting the minute hand right up to the edge of the dial looks so right. The big crown on that one looks great too. I notice that the number font is a departute from earlier versions but it's one I quite like. You shouldn't be a complete slave to tradition. Imho absolutely crucial point made by raysablade viz. the minute hand not too short, and going through to a small degree, the minute-markers; this makes for excellent legibility characteristics. Yes, the Orfina, Stockport, is anti-mag, though the model if I recall right, which is more similar in looks to the above, has no A/m. That is a good question regarding mag-ing it up. :) -would liek to know, too. 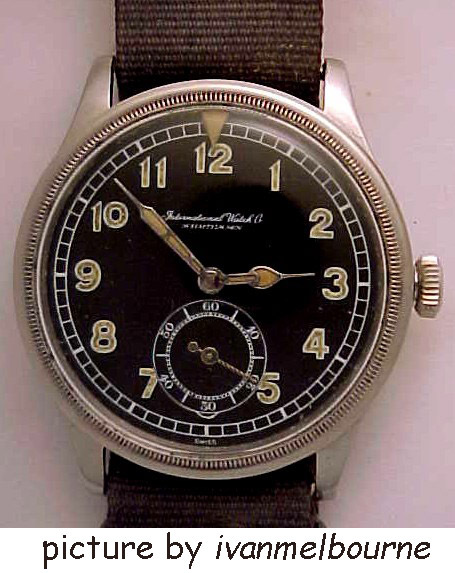 In WWII the FAA were allowed springbars, and indeed some commonwealth issue watche sfor the mil. selecteed springbars. so, froma traditionalist perspective, sprinbars are not a 'compromise, as such, noenethless, fixed lugs were more common. Originally Posted by Squid Nunc? Isn't the Mark IX with subseconds? Yeah, it is, that's why I said Mark IX 'style'. A real MK IX replica LE including small seconds should be great as well though. Just had another peek. I'd like to suggest that the indices should be placed close to the chapter ring. No spacing between index and chapter ring allowed, IMHO. That's a modern 'homage' interpretation. Once you get into the IX (and subseconds) then you are also faced with the problem of the turnable bezel ... strangely enough ... it appears to have a similar mechanism as the CAF. Whats wrong with the original as posted by our host on page 1 of this thread? It is everything I am looking for without any embellishments and as for those heart shaped hands in the watch pic above - well words fail me! Absolutley nothing! Make it so Eddie (just not too big!). Whats wrong with the original as posted by our host on page 1 of this thread? Nothing as far as I'm concerned. Who's saying there is? I'm not trying to start a fight with anyone but, in the past, I've made the mistake of saying to myself and others on this forum that I was happy with a watch when I was merely merely content. For example I found the hands on my Goldbird a bit of a let down. They looked fine in the photos and I was quite content when it arrived but after a few weeks some finishing details and a perception of a slight failure to match with the dial really started to bug me. So much so that I eventually sold it at a big loss. In contrast the way that the point of the hand meets, and perfectly matches, the chapter ring on the original MK XI isn't just OK or acceptable; its completely right. Its desperately sad to admit but, to me, excitingly so. On a watch like this, the dial and hands are a good 80% of the whole point and I'm sure most of us will be able to appreciate perfection there, if we see it. It follows that we should waste some time trying to find it and I'm sure that its in Eddie's commercial interest that we do. The orig. pic is tremendous, imho. The clarification of those who put in an opinion, imho, is a great sounding board, but not only that, it creates vibrant discussion, invaluable infomation and Wis, from some very knowledgable, perceptible and exp. persons (I do not count myself as any of the latter!-just a some views and reflections) which are invaluable. They/ the preceding discourse, within reason, creates much constructive interest, overall- imho. Of course we all respect greatly Eddie for his acumen as well as works, and for his final decisions. THis si a given. It's nice, too, to let it be known we care about the proj. and like good friends have views which we would not keep, jic they were not wanted to be heard for fear of a modicum of healthy reflection, within such reason as fit. I think it will be a great watch, for the fundamental aspects, as presented by Eddie in rather an ostensibly finalising form are excellent. Looking forward to this one, very much, too. I like it al lot! Possibly 38mm would be better than 39, but I guess that's just splitting hairs. This could definitely be a serious (ly cheap?) alternative to a real Mk XV, something that a lot of people aspire to but just cannot justify the outlay (where's Crusader on this one?). The date at 6 is a great spin, and keeps perfect balance. If I were a one-watch person, I'd still ave it, but the date didn't have a quick-set. :cry: Amazing how such a small thing can kill the love. I love those UTCs, I'd really like to get one sometime. You better hurry because the new ones are different (and not half as pretty :wink: ). May I cast my vote for a slightly domed sapphire (AR inside only). I think it'll be a hunt for a used one in the future at some point. If the majority goes for a slightly curved sapphire I'll withdraw my acrylic. I must say, I saw one of the Goldbirds and the 'curved-sapphire vs dial vs hands' complex looked terrific. I was totally impressed. I am all for the project. I'll throw in my two cents re the crystal: a domed, armored acrylic will get you out of the AR-discussions, it will be true to the original (the only Mark-11-homage to do so, except for the Frankenprojects), it will be closer to the "secured" crystals of the IWC, Damaskos and Sinns than a conventional glued-in crystal and thereby boast a feature uncommon in a world of plain-jane sapphire crystals. Watching the height is a good thing Eddie (as are the 20mm lugs - no fixed bars, of course, drilled lugs and/or shoulderless spring bars will be perfect). A domed acrylic, while adding to the height metrically, will not do so visually. The date at 6 will identify the watch as a true descendant of the SB line, and of course Eddie has made the "date at 6" a hallmark of his watch creations - to deviate from that policy would be senseless. I don't understand why people on this forum suggest the change of position. - minute hand goes thru minute markers to small degree (as per Rayzablade). With that sort of spec, it's a gotta have for me. Howzabout a red or yellow second hand to add a touch of fantasy to the homage? Or will everyone come down on me like a ton of bricks? And I'm all for Abraxas' white gold. I feel the script of the IWC is better than the one on the Speedbird ... I don?t know the font name but the tails on the 1s give the watch an overall flair. In terms of the crystal ... it depends whether THE MAKER wants to make ?a tool?, or something that ?looks right?. It is a silly argument really because it comes down to sapphire or acrylic? Neither would stop me having one (if I was to have one) so, it?s up to THE MAKER to make a decision. PS Don?t forget Dave Essel ... 11mm thick. ...20mm lugs - no fixed bars, of course, drilled lugs and/or shoulderless spring bars will be perfect). The two principal types (IWC and JLC) of MkXI. -Note the differences in case design, taper and appearance. If one looks through the aforementioned web-link, at (I), further derivations of hand sets, and dial differences can be seen. IMHO, the examples in the featured pictyre, as above, with the hands and the degree of mvt through the minute markers, in particular, looks jsut about right. IMHO: I prefer a 38mm to 38.5mm Case (with crown). Anti-mag and waterresistance as good features. Exact figures are open to variation, within practicable parameters. Crystal, Crusader's argument seems v.good to me, nonethless, as long as the crystal is not overly curved (reflection issues); I am not particular as to the material, as long as it is well suited. Naturally one is in trust of the maker. Hands are v. important (imho): Their sweep must be throught he minute markers, to a good degree, as per pics. above. This is crucial for quick reading, imo. AS to material, I am no expert, though the fewer chances taken with the hands, the better, however, if a less dear alternative is suitable, that wouldbe a good idea, imo. The Date function at 6, as has been written, is well proportioned, and a sympathetic, very unseful feature. 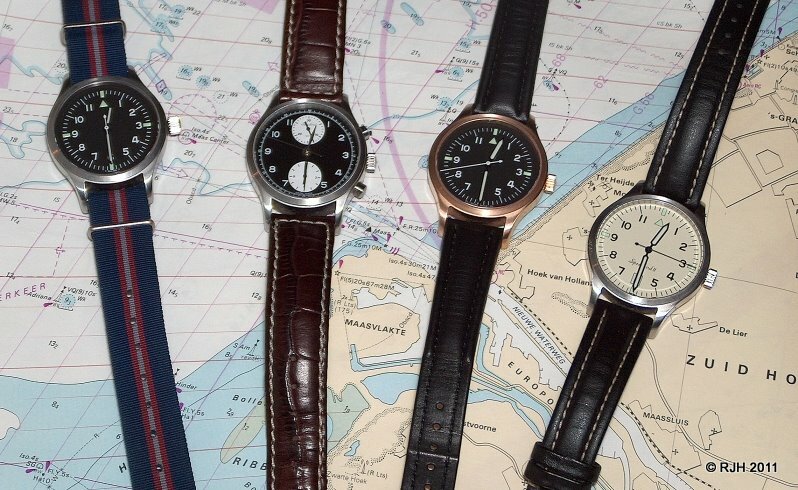 This, as Crusader points out, together with the case (dimesnsions, design and waterproof anture), the crystal and v. high quality mvt links it to the Mk XI, the great TF watches, but not overly so. It consititutes, and should be, a functionable measure, thereby distiguishing it further, though not too much in its discreteness, from other MkXI homages. It is a timely well thought out improvement, imho. The position of it is right, imo. As always, am open to changes, new ideas and so forth, in discussion with this. Picture Sorted, thanks for the link Abraxas. inwards, as the IWC markers tend to lead to. the start of the thread. -In regard to the seconds sweep hand, a point of difference btwn the two main variants, as pictured above, I amostensibly neutral. The IWC may have one over the JLC, perhaps not. On balance, it may well be. Eddie the watch looks great! 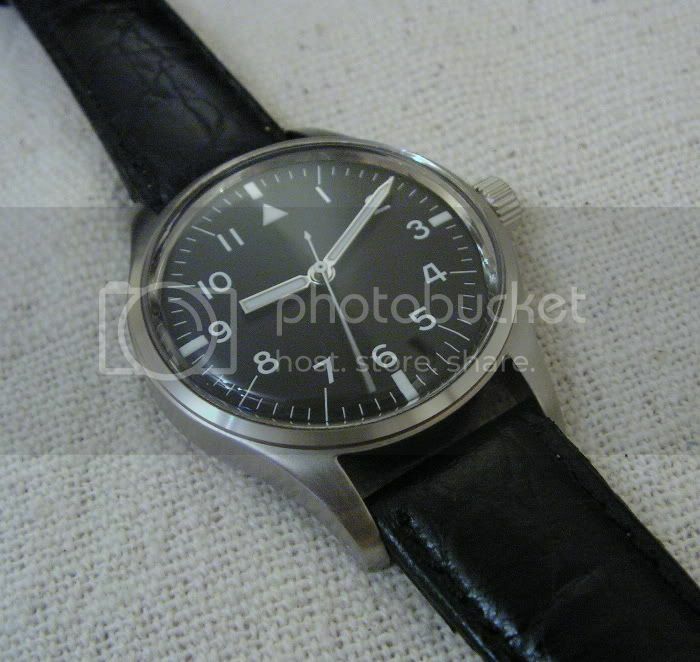 I would have it as shown on 1st page, 38/39mm is fine as it can be worn with dressy clothing. My girl hates me going out with big diver/military 40mm+ cases on my wrist when we go out to friends which is why I recently bought a nice dress watch. If that stays as is I will have one! I don't check up for a day and look what pops up. I like it but I thought the SP3 was going to be a UTC. My birds could let anouther in the club. Looks great based on the original pic. It would be on my wish list, no doubt. Drilled lugs please :) Eddie. And very sterile with the date at bottom. Ta. 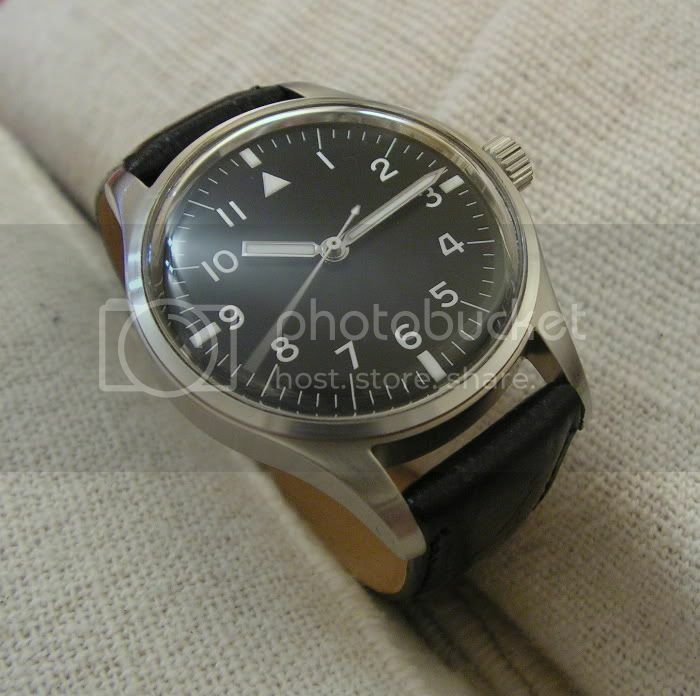 In regard to what I have written (as above) and that which others have written, I like the design as in the orignal pic, in clarity, as per the JLC style in contrast, by example, the IWC as pictured above, as one method of approach to the design. The shortened lines nr. the date;6 position are an excellent idea and modification imo in several reaspects. E.g. in framing, a slightly larger field or margin at he bottom or 6postioin is most welcoming to the eye if read from this, i.e. it is not red from the other side, as a watch is normally not, therefore this principle looks to be well employed here, as can be seen, with good grounding in theory, which is confirmatory from that perspective. Naturally, the eye is the best way, nonethless this reinforces it and explains the sensation in a certain way. The evident addition, as per written above, to be clear, is that the lines should extend closer to the edge-like int he JLC above. As such and in view of the ergonomic considerations made in my previous post (shall not repeat it here), that upon reflection seem to hold well to my eye, the extension may be made, without the batons extending beyond the radius of the minute batons, as they are in the original pic. This, imho, narrows the field, unnecc. whereas whence there exists a greater continuity of the radius of markers it is naturally easier; clearer and more open to ones' eye. Clarity is at the heart of the principle of the design, imo., not only of a personal perspective in this regard. This is a reflection made in good conscience. I'm rather sure it shall be a corker, as is made. And very sterile with the date at bottom. Ta. Good point to raise, Steve ... eddie, what's your policy (or intentions) regarding Precista vs. a sterile dial for your watch creations? Perhaps 'England' where 'Swiss' would be at he very botton, discteetly would be a good touch, according with the continuation of a fine tradition of style and making e.g. the Precista with diver with this. 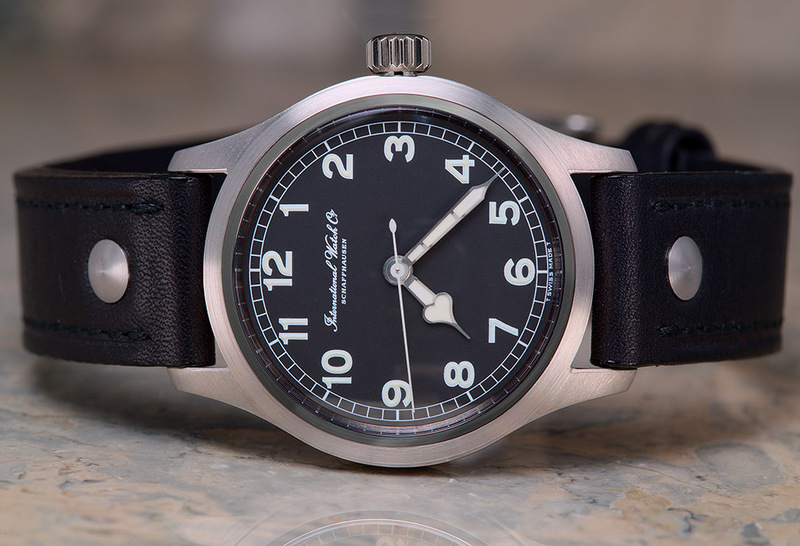 I would not be adverse with a 'Precista Watch Co.' or something long enough in the style of the JLC or IWC, tho the stylish dynamic underlining style of the JLC and v. small lettering compliments the proportions well, also acting as a brake between sections of the watch. It highlights the batons and the minute lines if one looks at the pics above, imo, which adds, in fact to the clarity and overall cohesiveness acting as a confirmation of this to the eye and in mindfulness. Of course, the lettering need be very small indeed, but ledgible enough. 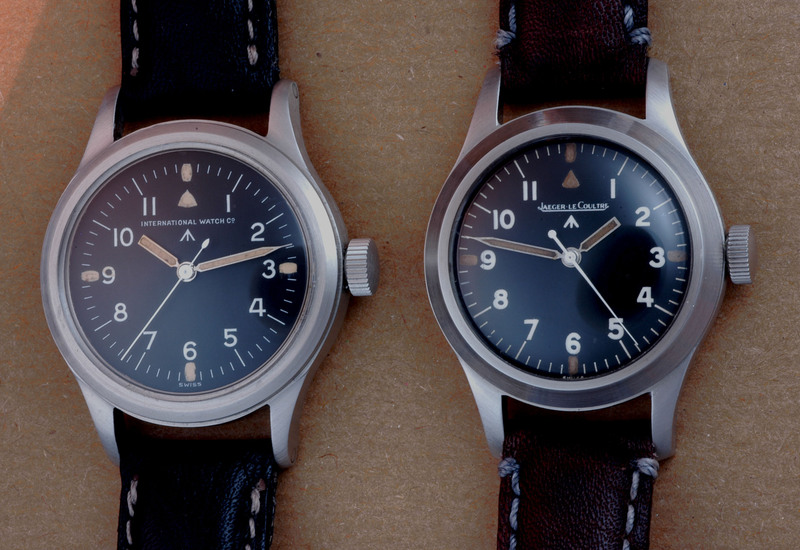 the distinctive letters of P and W would be differentiaion enough as with the J L C above- a clever design method by them, imo, than perfects the watch layout without being OTT, by any means; quite the opp. Not signing to my mind is somewhat trite. But that is a taste and an unsigned is perfectly acceptable in many ways. IMO it would not be too much, but would complete the watch stylishly. Otherwise, imo, it looks a wee bit incomplete and 'scared'- not the prodigal son, but not 'wanted' either. For me it is a matter of pride to sign a great watch, be it very discreetly, esp. with a perfectly respectable ( in fact, reading around and listening, a very respected maker). I realise that some may not like the latter sugg. much, but one has to be honest in their opiions, and that is just what it is. Maybe, even a choice could be made. However, again one understands that it may be impractical to have a choice. Taking up Ailfrid's (who appears to have lost - again - the "+" marking him as an improved formula specimen - argument, I would like to add that I have looked at the fully sterile dial of a Yao dial for a few weeks, and I wouldn't mind the maker's name on the dial ... would need counterbalance between the hands and the 6, though.